Our comprehensive Theater Program strives to give all participants a unique and inspiring perspective on new ways to learn and communicate information. Performances provide a first-class theater experience for students and teachers demonstrating the vibrant way literature springs to life using theatrical interpretation. Student Workshops take the students from audience member to performer in a sequenced delivery. 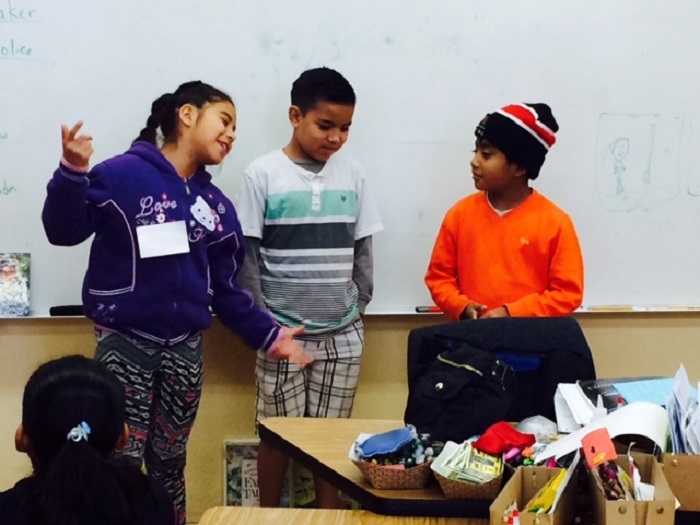 The students explore theater strategies that help conceptualize ideas, form opinions and make connections to daily life while building self-esteem. The Parent Workshop discusses the impact reading aloud has on academic success and the importance of parent involvement. Professional Development workshops focus on utilizing theater arts strategies to teach core curriculum and give students alternative ways to communicate, learn and develop. 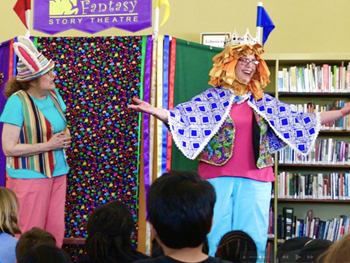 Schools may choose up to three 45-minute interactive story theater assemblies to be presented to the school population. Each performance includes four multicultural folk tales and fables and is complete with set, costumes and props. All students participate in the final story, either on stage or in the audience. The assemblies give the students the opportunity to see literature presented in an alternative way and allows the children to learn themes, plot details and characterization through aural and visual cues. References to the performance are discussed during student workshops to illustrate various theatrical concepts. A Program Guide is sent to the school in advance of the performances to familiarize the teachers and students with the stories that will be presented. Our acting workshops for students are provided in 3 to 12 week residencies and schools choose the number of participating classes. 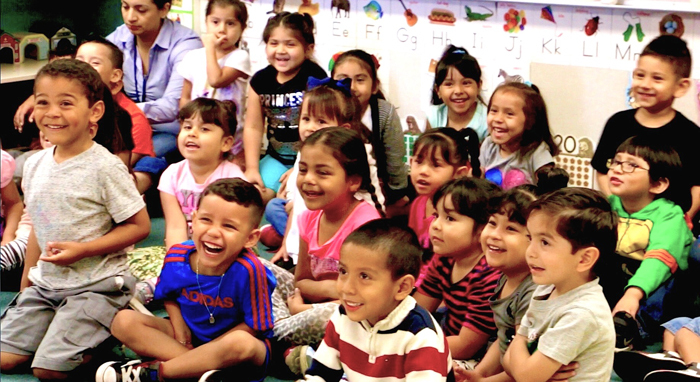 We offer two programs, Sharing the Story for pre-K and Kindergarten and From Page to Stage for 1st through 5th grade. Students learn they CAN DO IT! Parents embrace the importance of reading aloud to their children and their essential involvement in their child’s education. Discussions are facilitated about why it is necessary to have conversations with your children everyday and how storytimes at home develop comprehension, fluency and language acquisition. Vocal techniques are modeled to help parents develop expression and vocal variety. The parents then read aloud using story material that is provided with the assistance of the instructors. We’ll conclude by discussing the proven academic benefits of reading aloud as well as how to support the positive bond that is created between child and parent. 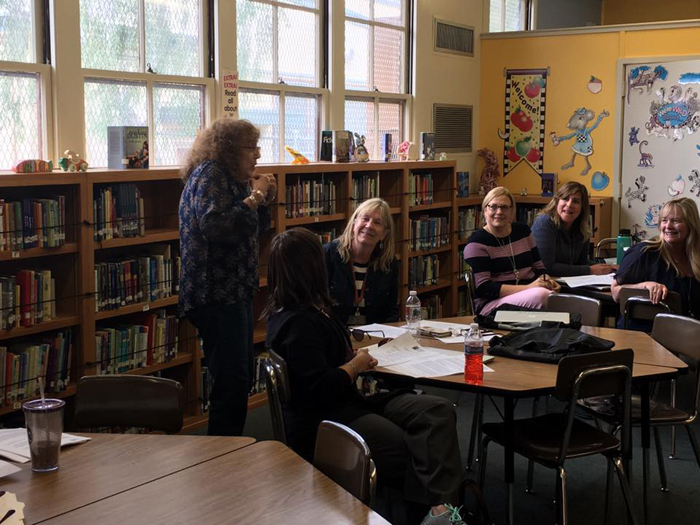 The Professional Development Workshop, Putting a Story on its Feet, examines how theater arts strategies can be integrated into curriculum to develop critical thinking and comprehension skills across all disciplines. Techniques are discussed that allow children to learn kinetically while improving collaborative skills and building confidence. Theater programming gives students and teachers an alternative approach to material that affords some students a chance to succeed in a new arena. By rehearsing and performing in the classroom, we are able to demystify the theater teaching process and validate classroom performances as excellent tools for exploring and creating art and communication.